Woodland Planting for a sunny glade. It is always a challenge to design Woodland Planting in a garden. You need to be clear on just how much light will be able to reach the plants you put in. The owner of this garden loved her tall cedar trees and the woodland feel of her garden, but there was no space to sit in the afternoon sun, and no interesting plants to enjoy. The sunniest part of the garden in the afternoon was full of large holly bushes, and an old compost heap. I felt that once the we cleared the area under 3 cedar trees, a patio or a deck would look out of place, too formal. This area of the garden needed something more natural, and something that wouldn’t look messy when the pine needles fell. 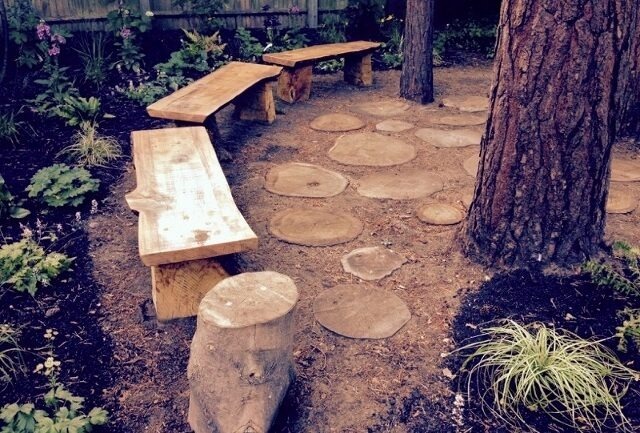 I decided to use wood rounds as the basis for my seating area. I have seen these used as paths before and it seemed like the ideal solution. Working with my local tree surgeon, and my contractor we selected some beautiful whole sections of oak and cedar rounds. They were big heavy pieces that could withstand years of being partially buried in well drained soil. 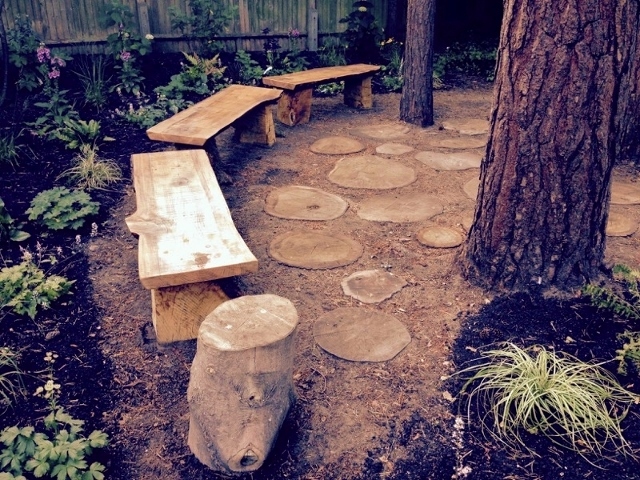 We also commissioned some beautiful cedar benches made with whole slices of tree, letting the natural shape of the tree remain, these will age to a beautiful silver colour and blend into the woodland scene over time. For the first time in 10 years my client has a place to sit to catch the last rays of the sun whilst the rest of the garden is in shade.